This recording is an exquisite sample of the Steelband's musical magic ranging from Classical renditions to Calypso, Latin, and Reggae expressions of familiar melodies. First formed in 1993 by Sheldon James Musical Director, Caribbean Magic then consisted of members of the Amoco Renegades Steel Orchestra. Although their has seen some personnel changes over the years, Caribbean Magic has retained its professional and unique sound. These attributes have contributed to the steel band's success both locally and internationally. 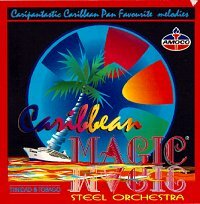 Caribbean Magic's instrumentation delivers a full range of musical sound from soprano pans to bass pans, with double second, and cello pans providing mid range accompaniment. The drums provide rhythm support and the drummer also plays the double second pans during classical renditions. Whether the occasion calls for dancing, listening, background music, or accompaniment, Caribbean Magic have demonstrated time and time again that they know how to make an event truly special. They bring the same enthusiasm to a cocktail party, festival or chamber concert that they project on stage as the 19-member group, which travels to Japan and Europe yearly.